Access a personalized menu of frequently-used options. 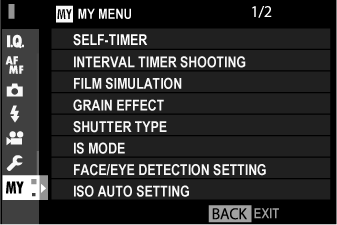 To display “my menu”, press MENU/OK in the shooting display and select the (MY MENU) tab. The tab is only available if options have been assigned to MY MENU. Highlight USER SETTING > MY MENU SETTING in the (SET UP) tab and press MENU/OK to display the options at right. Press the selector up or down to highlight ADD ITEMS and press MENU/OK. Options that can be added to “my menu” are highlighted in blue. Items currently in “my menu” are indicated by check marks. 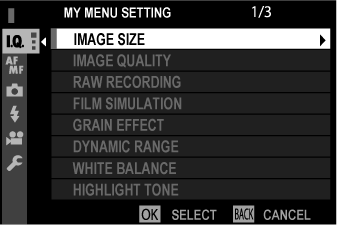 Press MENU/OK to return to the edit display. Repeat Steps 3 and 4 until all the desired items have been added. 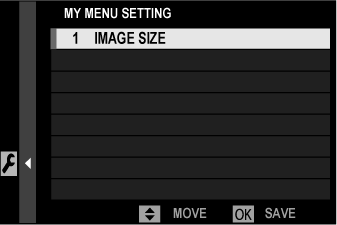 “My menu” can contain up to 16 items. 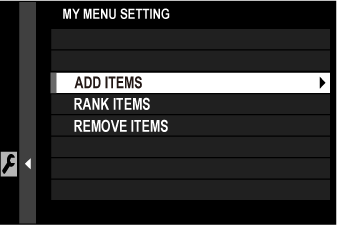 To reorder or delete items, select RANK ITEMS or REMOVE ITEMS in Step 1.